Mrs. Beverly Helilo is from Goroka and is the founder of Mother Beverly Help Ministry. The ministry is a not-for-profit Christian organization aimed at ministering to people residing in the rural areas of PNG. 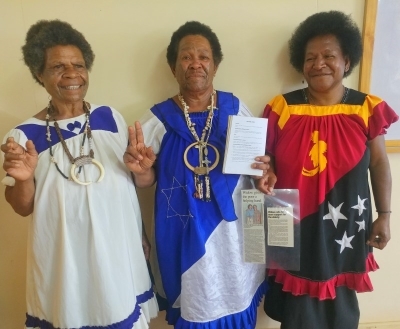 This ministry has identified the physical and spiritual needs of the most destitute and neglected people in rural PNG and seeks to build Christian values in their communities through Bible out-reach programs to encourage happy, prosperous, peace-loving, and stable communities. 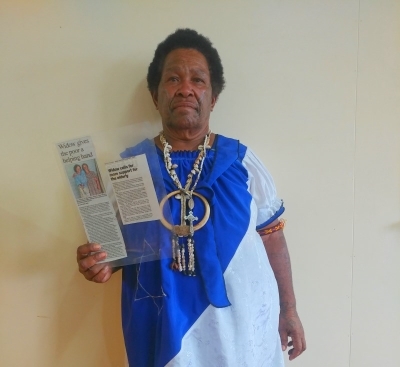 So far the Mother Beverly Help Ministry has spread through some districts in the Eastern Highlands, Madang, and Simbu Provinces and through other parts of the highlands region. It is Mrs. Beverly’s aim to reach the unreached in these areas. 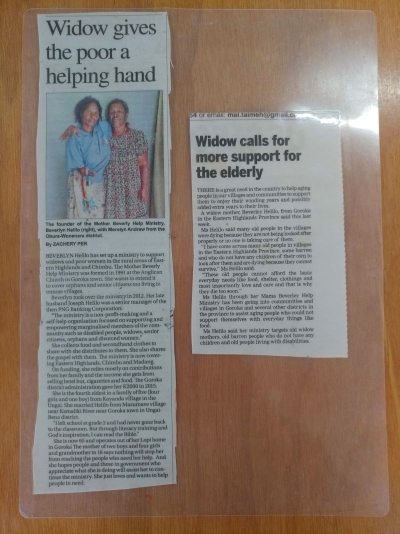 A widow herself, Mrs. Beverly has also had the opportunity to help out other widows through her ministry. The ministry raises funds from cash crop produce and a mini trade store, practical donations like clothes from a number of second-hand stores in Goroka, and financial donations from friends and family. Supporters Rose Tepori and Ania Bilo, as well as many other mothers, were moved by the work and initiative Mrs. Beverly has taken upon herself. These women continue their support through prayer and helping wherever they can because they have witnessed God do many wonders in the lives of people as a result of the Mother Beverly Help Ministry. Despite the limited funding and support the ministry receives, it remains successful, inspired by Mrs. Beverly’s dreams and, most importantly, its foundation on Christian faith, love and friendship. “She lit one fire and that fire has touched us and others and it continues to grow. During Mrs. Beverly’s ministry work in sharing the word of God, she has encountered many illiterate people and, as a result, she recently purchased two Audio Bibles at CRMF. She remarked that the Audio Bible is a great tool in reaching out to illiterate widows, disabled, and homeless people in remote communities. She added that she has little to give, but what she has is a true treasure –the word of God. Not just speaking the word, but also living it, just as Jesus spoke and lived the word. Mrs. Beverly said that CRMF is helping her ministry serve its purpose to reach out and minister to the needy in rural communities through the use of the Audio Bible and she is grateful to Papa God that CRMF provides such tools. One of the Audio Bibles she purchased was given to a rural community and the other she has kept to use for future out-reach and ministry programs carried out by the Mother Beverly Help Ministry. 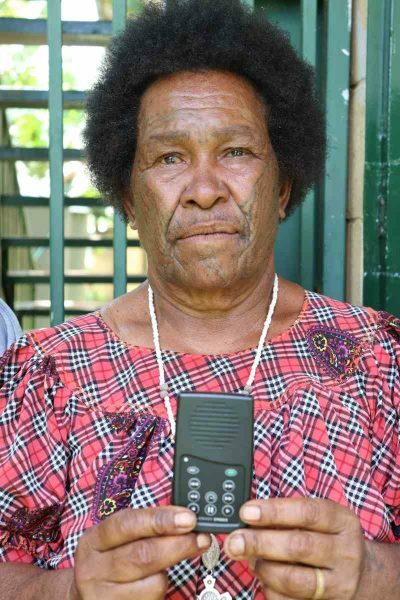 From what was once a small ministry, the Mother Beverly Help Ministry has grown and is continuing to grow,yet they need more help and financial support to continue their work in ministering and reaching out to the needy in PNG’s rural areas.